On the road now for several months, questions about the purpose of our travels sometimes enter our thoughts. In the beginning it was about changing the rhythms of our lives. Mine from the frantic hustle of plane rides to corporate boardrooms and an ever increasing pressure to deliver with fewer resources. For Michel, it was about reaffirmation of himself as an artist and perhaps distancing himself from the US political system and the constant negativity created by the daily news media chatter. After almost five months we have mostly achieved these goals, if they really were goals. Our lives move at a very slow rhythm now. There is no pressure or stress for me at all. Michel is constantly finding ways to express his artistic side and his works are well received. We are more aware of the Asian political situation then current politics in the US. So what is the point of this constant moving around? We occasionally stumble into extreme beauty which inspires us in some way. We meet other travelers and expats and make short term connections with them. Maybe it’s time for something more lasting? Maybe it is time to take advantage of our US dollars spending power here and settle down? We are faced with that choice in a location that can be called “paradise”. 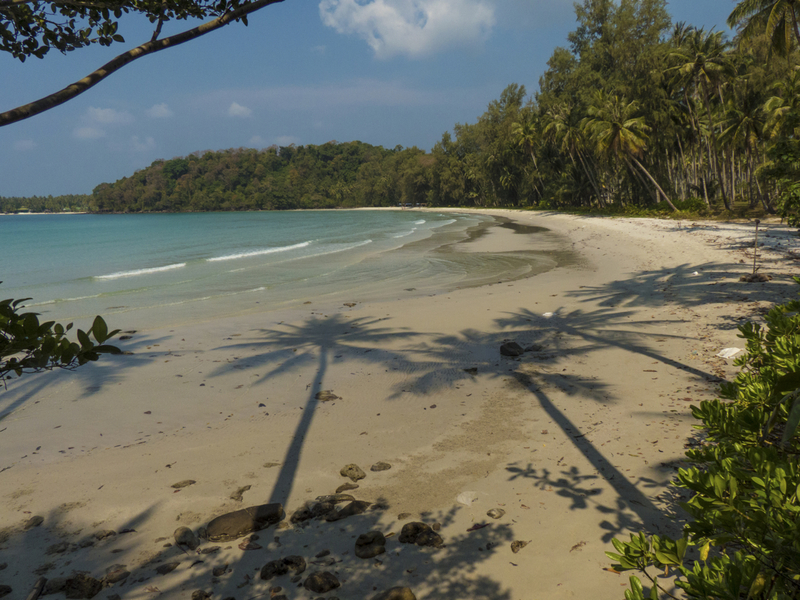 On the mainland, across from the island Koh Chang in Thailand, there is a deserted resort for sale. There are 8 bungalows and a main house. 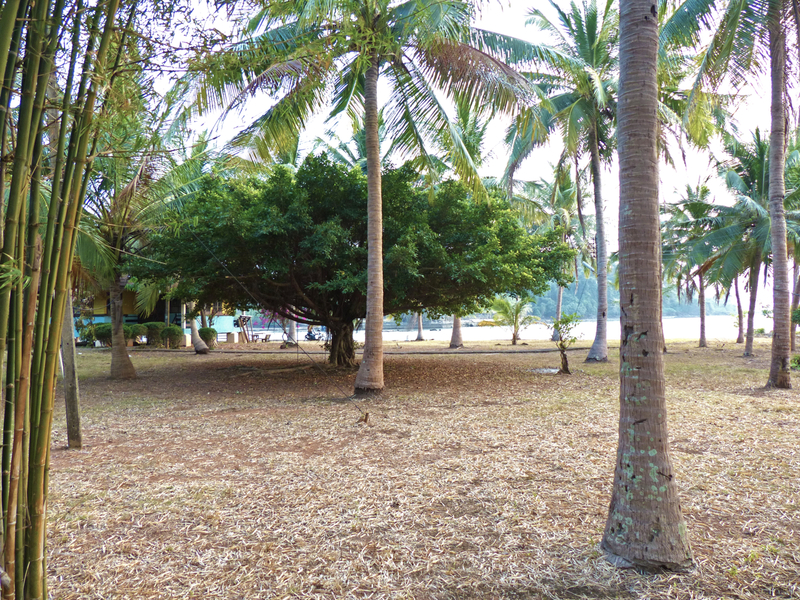 The property is on a large piece of land that sticks out into a beautiful bay. The water is clear and blue green. The garden is beautiful as it is full of mature bamboo and large trees. The resort has not been taken care of for a long time so many things are falling apart but as we walked the grounds fantasies of grooming and planting in that garden can’t be helped. It’s easy to imagine spending a little bit of money and turning the whole place in to a modern resort. Hiring staff, fixing up the bungalows, and eventually creating a thriving business. Our own little paradise in Thailand. Wait a minute! Turn paradise into a thriving business? Have we completely lost our minds?! For those of you who are concerned that your friends may have have lost their way; you can relax. It was just a passing fantasy. It’s not easy for foreigners to buy property here in Thailand. Also, we have watched how hard the expats who live here work to make their clientele happy. It’s not a life we would choose for ourselves. Not yet anyway. It does beg the question though. What will come of this search for paradise? 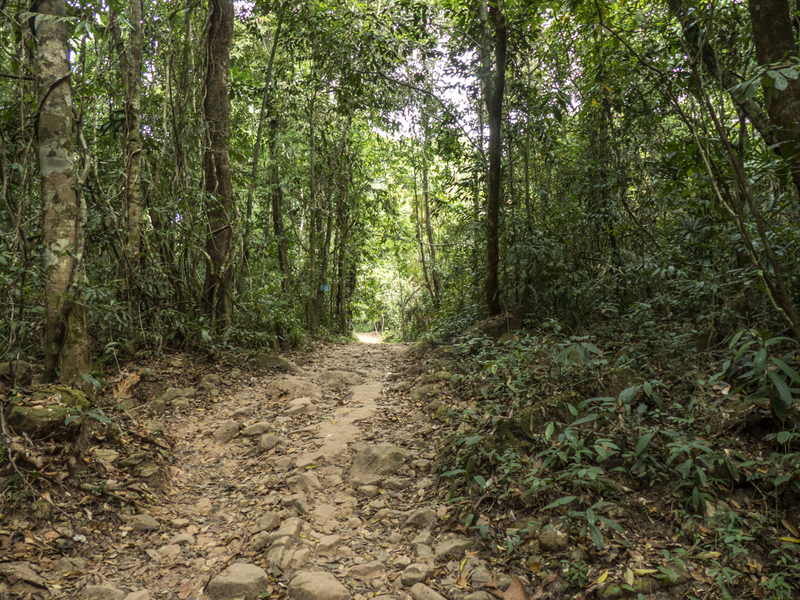 Where will this road end and will there be anything lasting to show for it? We don’t know the answer to that question but maybe the fact that the question is even being asked is a sign of a change in our outlook. We arrived in Thailand using our 60 day Visas without issue. After crossing the border the roads suddenly became well paved and the buses roomy and comfortable. 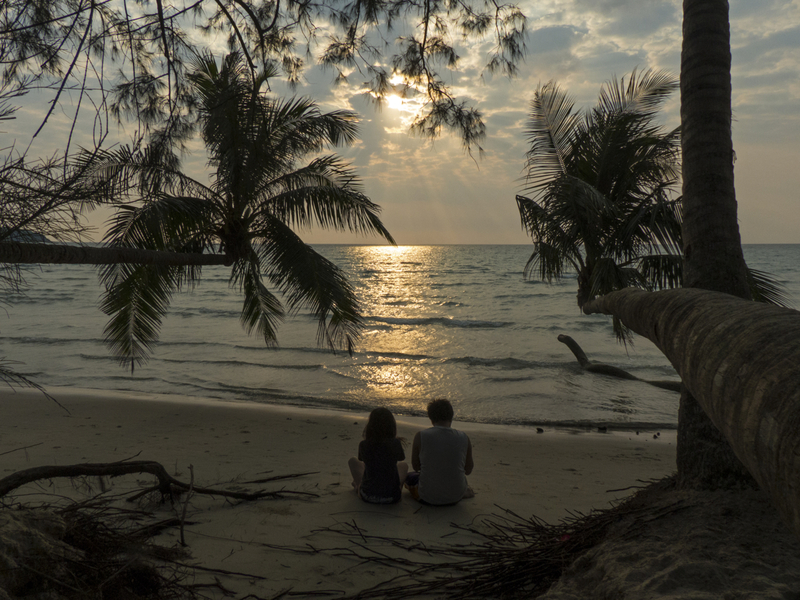 We spent a couple of nights in the small city Trat located about an hour away from the border. It feels comfortable being back in Thailand. My small Laos vocabulary mostly works here. There is less plastic trash thrown everywhere then in Laos and Cambodia. Generally Thailand seems more civilized then either of the previous two countries. After Trat we moved to a place so small it might not have a name about 30 kilometers north of Trat. 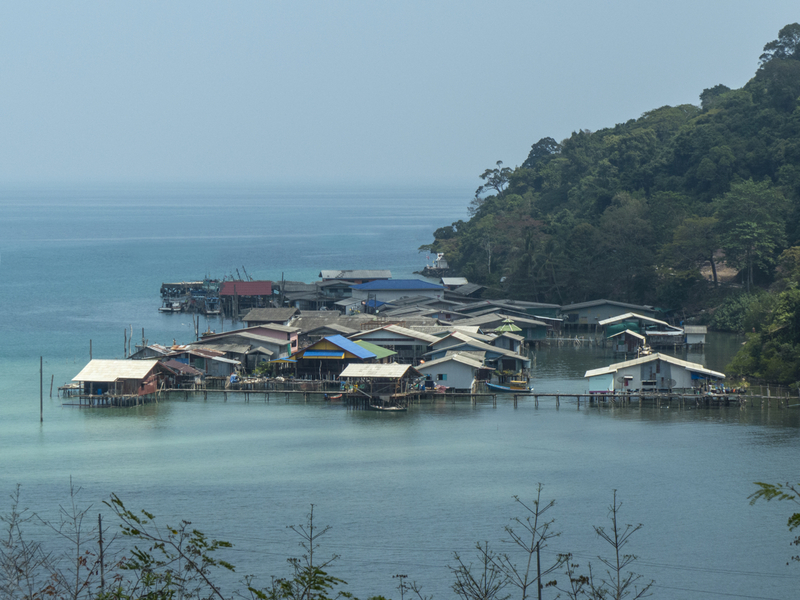 There was a lovely bay there and a few farang staying in long term rentals near a sandy beach. Michel and Jean Louis left me alone there for a night as they rode motor bikes over some treacherous terrain on the nearby island of Koh Chang. After a very tranquil night, I went for a swim and was surrounded by thousands of small florescent green fish in the crystal clear water. 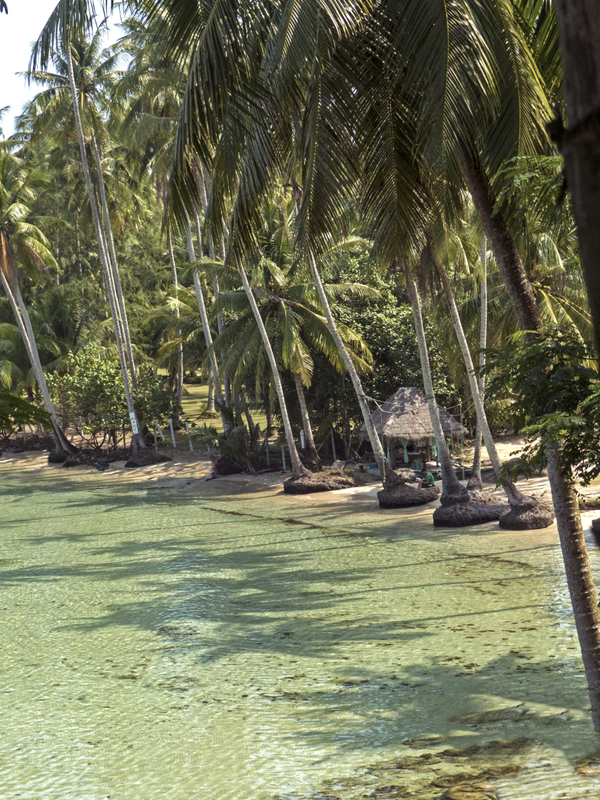 Perfect weather, no Internet, comfortable bungalows, and a mostly deserted pristine beach surrounded by jungle with coconut trees reaching down toward the water. If this was not paradise then it was pretty damn close. And yet the search for paradise continued. 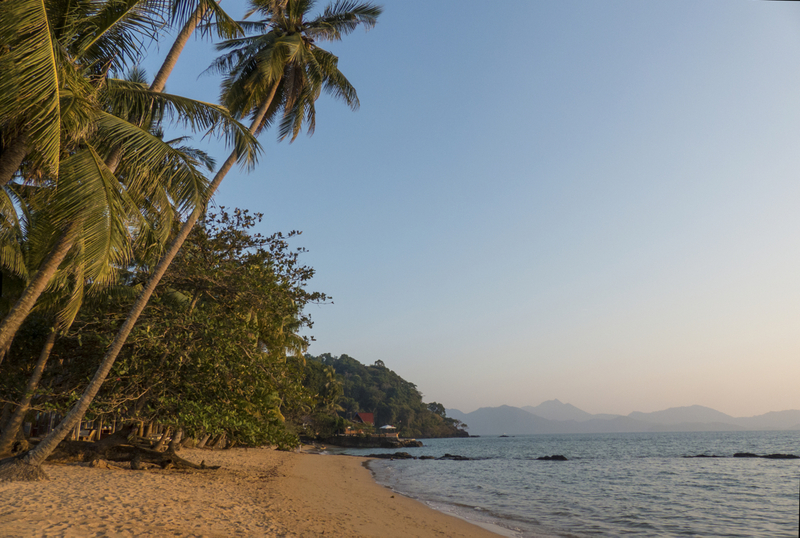 We moved on to a small island called Koh Kut. 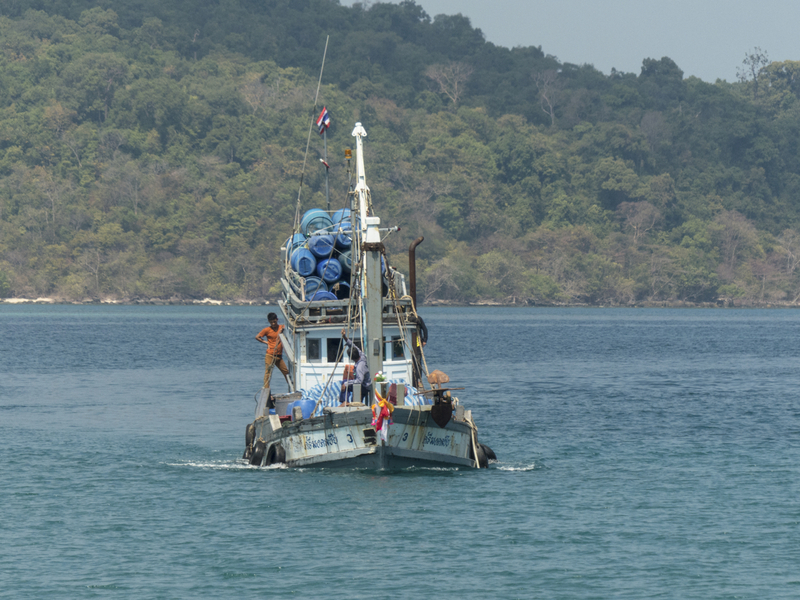 An hour on the Koh Kut Princess boat brings you to a tropical island in the Bay of Thailand. The beaches are white sand and the water is as clear and blue as the Bahamas. There are mostly large expensive resorts on the island and they will soon be full of Chinese tourists celebrating their New Year. 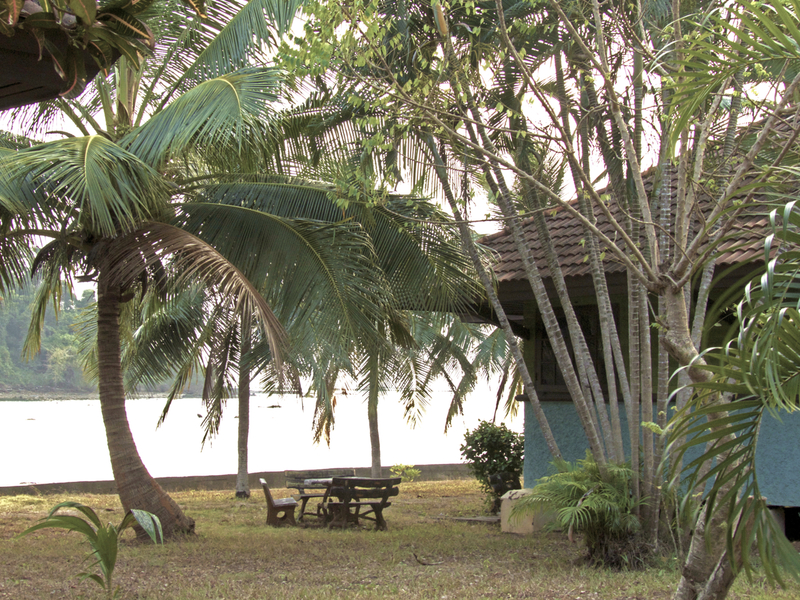 But if you search a little bit it is possible to find a small inexpensive bungalow about 500 meters from the beach. A backpacker guesthouse called Cozy House. It’s quiet and peaceful here and costs 550 baht per night. The guests are all our age and most are long term travelers. 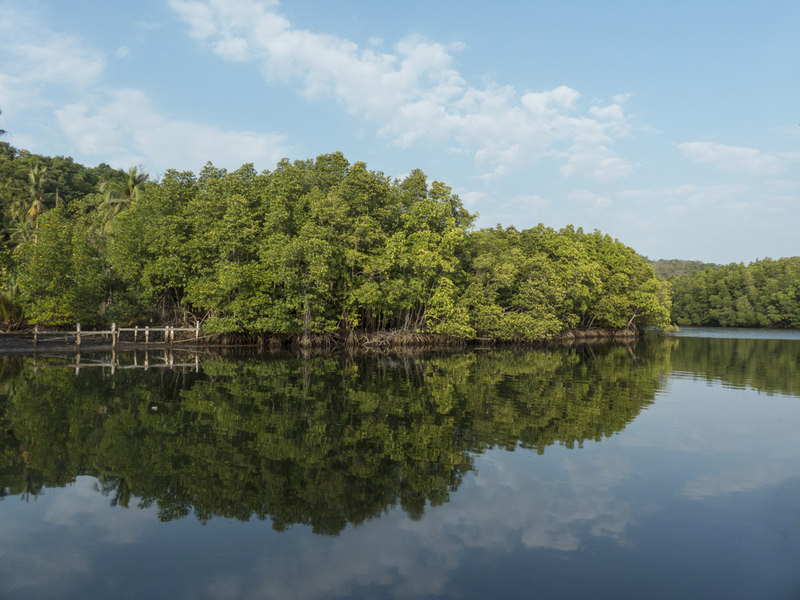 The small mountainous island is covered with jungle and a river runs down through beautiful mangroves until it reaches the bay. 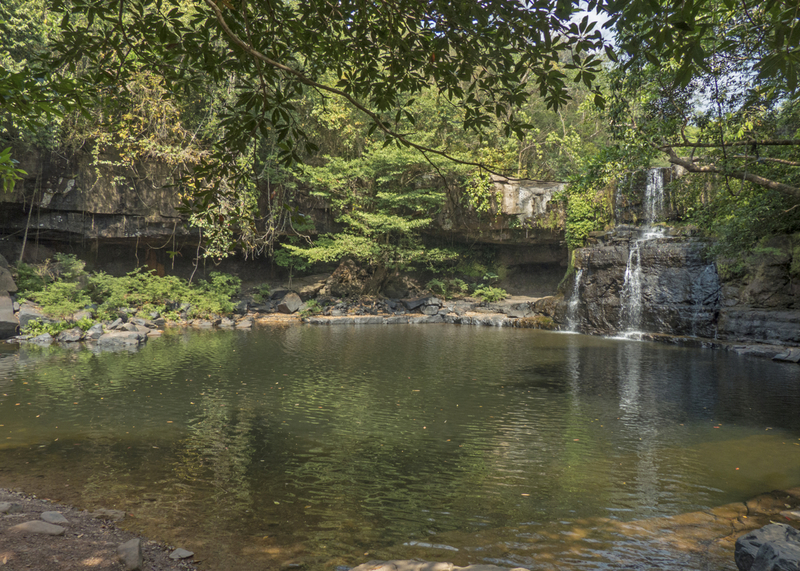 After a short hike through the jungle we found a waterfall with a deep pool for swimming. The water was cold and the little fish that live in it came and nibbled our feet as we stood in the pool. The swim was a wonderful way to cool off after the hot hike up the hill. Another day Michel rented a motorbike and we took a tour of the island. We had a fun ride up and down steep hills until we reached a small fisherman’s village called Ao Yai. We stopped for lunch there and watched the fisherman lay traps in the bay. There is a small restaurant in the village where the guests select their fish for lunch. Michel selected a little snapper, which was barbecued in salt perfectly. After the fish we had scallops, my first time with the little orange feeder tube still attached. It added a flavor almost like salty roe to the mild taste of the scallop. We watched the local fisherman work and chatted with a group of foreigners who had sailed in on their catamaran. Just another perfect day. I looked up the definition of paradise on-line: 1) A place of ideal beauty or loveliness. 2) A state of delight..
Our lazy days are filled with relaxing swims in the smooth clear ocean water. Our evenings spent visiting with the other travelers enjoying the island. Yes, it is time to stop searching for paradise. No need to buy or build anything here. No need to find a reason for enjoying these perfect moments together on the road. Finding Paradise is not so difficult after all. We just had to open our eyes and realize we are living in it now. Beautiful beaches and water! It is paradise! As you know the minute you buy a place it would be work with stress too! LOL You can trust me on that one…. the dream usually looks better than the day to day effort required to maintain it. (ie. our ranch case and point… lol ) There is no way to avoid such realities of living and life for very long in this world. Studies show that those with the means to have everything they want have an inverse relationship with happiness (and often fall into addiction and/or bigger and bigger appetites for pleasure and end up owned by such things). True happiness it is fleeting for most of us and true paradise ( “1) A place of ideal beauty or loveliness. 2) A state of delight” ) is found in love and understanding and relationship that goes beyond our physical comfort or experiences or stress level, and comes through more in a deep knowing of how much we are loved and what a gift our lives and the beautiful creation around us are and knowledge of a love and life that goes beyond our daily experiences. That greater purpose and hope if you will. That feeds the soul more than any experiences. Love God and love one another is a form of simple paradise….we can rest in that. We humans make things so complicated. I am so glad you all are enjoying yourselves there. I love the details of your account, like the little fish. There are many beautiful places that could be labeled paradise in the world. I don’t know that your travels have to have a purpose in them for now, other than you healing and enjoying and learning and relaxing. I know for me I find it to be so true the saying “everywhere I go, there I am” meaning that the grass always looks greener from afar, until you arrive and chew on it for awhile. If that makes any sense. Well, enough of my going on. Love the pictures and blog as always. Love you and Michel. We are here if you need us. Enjoy those beaches… they sure do look lovely. Enjoy your travels. We will enjoy. Love to you and yours!